Radisson Property — LaSalle Exploration Corp.
Radisson is only beginning to reveal its mineral potential. Radisson is located on the Eeyou-Istchee-James Bay Territory, a vast area in west-central Québec in the early stages of exploration just beginning to reveal its mineral potential. The property is located within the LaGrande greenstone belt near the contact with the Opinaca metasedimentary subprovince. Since the initial discovery of the Eléonore Mine in 2004, several companies have reported new auspicious precious and base metal mineralization including LaSalle on the Radisson Property. Originally acquired in 2011 from a third party and under option agreement, the 86 claims comprising the property are now owned 100% by LaSalle. At the time of acquisition two mineral showings were reported in the Ministère Energie et Ressources “MERN” database: Kakautisit NW (LeTourneur) and Kakautisit NE (Leo). The showings were described as massive sulphides band within the Langelier Complex. Another showing, Eli presenting anomalous copper and nickel values, was also discovered by the previous owner. LaSalle completed an airborne VTEM and magnetics survey and discovered several conductive zones extending over several hectometers: such as C-4 and MM5. These zones correspond to sulphide mineralization dominated by pyrrhotite, chalcopyrite and pentlandite bands parallel to the foliation within a peridotite at the contact of an iron formation. Channel sampling over these zones retuned anomalous copper and nickel values with the best results being 0.1% Cu, 0.25% Ni, 168 ppm Co and 0.2 ppm Pd over 29 m at MM5 and 0.18% Cu, 0.3% Ni and 0.22 ppm Pd over 4.5 m over Eli. The Cu-Ni mineralization was the focus of the 2013 field campaign. 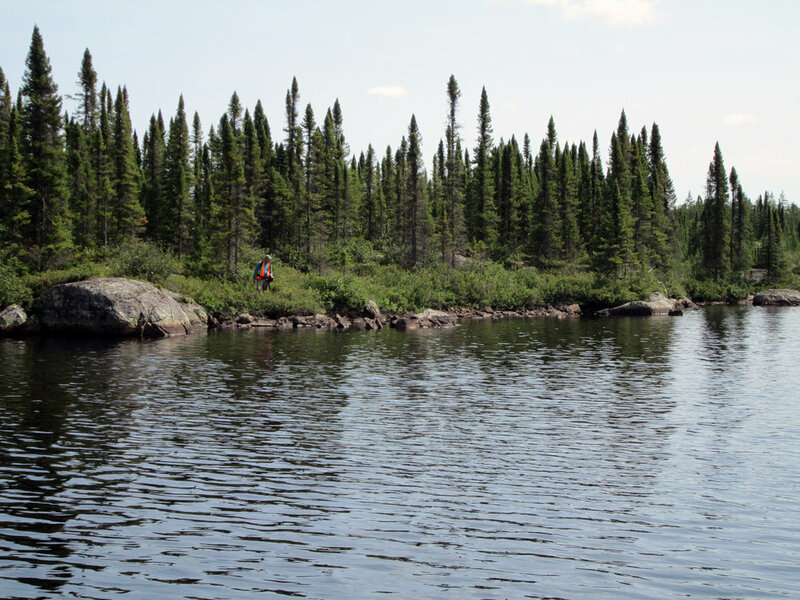 In 2014, LaSalle conducted geological mapping and prospecting over portions of the property to better understand the property geology and mineralization, along with additional channel sampling. Significantly, the mapping revealed a previously unrecognized volcano-sedimentary belt running east-northeast intercalated with a gabbro-anorthositic complex exhibiting a disseminated chalcopyrite mineralization found in numerous areas. The extent of this new greenstone belt unsuspected at the time of the acquisition increases the chances to discover large mineralisation. Several grab samples graded up to 5.3% Cu. Gold, though also hosted in quartz veins, is generally associated to the chalcopyrite and reaches up to 25 g/t. This mineralization does not respond to electromagnetic methods other than locally to the Beep-Mat. A NI43-101 report describing the work done over the property is in progress. Prioritization and drilling of the best Au-Cu zones. Gold-copper-silver distribution in grab samples.